Neuheisel delivers Mein Man to cure Pu-Pu Offense, leaving Egg F.U. Young on Carroll’s face, and Thai-massaging a Happy Ending out of a long, hard quest that seemed to DRAG-ON forever; And how will the Neu Golden Triad BeatSC? Ancient Chinese Secret! Forget it Pete — It’s Chinatown. Okay, before the letters start pouring in, we are well aware that Norm Chow is a full-blooded American, born in Honolulu, Hawaii, so we are not mistakenly implying that he is Chinese. Not that there would be anything wrong with that. All we know (because of Wikipidia) is that his name is of Chinese derivation, hence today’s Asian-themed (attempts at) humor and (almost) All-Asian PICTORIAL. No Racism should be inferred. Now, on to the Celebration, which should be akin to the Parade Extravaganza that they have for the Chinese New Year (as if everyone didn’t just jump down to the pictorial). According to ESPN, Norm Chow is going to be announced today as the new Offensive Coordinator for the UCLA Bruins. This will complete a three-headed monster of Coaches that the entire Country will envy: Head Coach Rick Neuheisel, O.C. Chow, and D.C. DeWayne Walker. All three of them were considered for the Bruin Head Coaching job, and now they will all be working together. Ironically, the Mighty Bruin Triumvirate that is going to topple Troy from their precarious perch, is made up of three people with strong trojan ties. Neuheisel went to sc law school, while Walker and Chow were both Assistant Coaches there for Carroll. Fig Tech fans would have LOVED to have Chow come BACK to usc to take over his old post as Offensive Coordinator, but that possibility was nixed by Pete, who supposedly had a falling out with Chow. Carroll’s ego was reportedly offended by Chow getting all the credit for the Bush Years Offense. After Chow was fired by ex-trOJan Jeff Fisher earlier this month, he could have gone to other teams in the NFL, and he also could have gotten a Head Coaching job at a smaller school. Either way, he probably would have gotten a bigger salary, although with his Termination deal from the Titans, it wasn’t much of an issue. What was important to Chow was coming back to his House and family in Southern California, and allegedly, his desire to compete and beat Pete Carroll, and Pete Carroll’s ego. Wouldn’t that be funny if Carroll bolted NOW? Would it look like he was scared of the Bruins’ three-pronged attack, Chow’s prong especially? Would Chow regret his decision? Would he take a Head Coaching gig at sc? Would Norton? THAT would be great, because if the Bruins’ staff stays intact, whoever is running usc will be run out of town. The only problem is, it’s not going to stay intact. Chow is older, and while we would LOVE to see him stick around for at least a decade, it would be surprising. DeWayne Walker, who is coveted as a Head Coach and would like to make the jump, will be even harder to retain with each passing year. But for NOW, while they are all here, the best instant ramification is: What Bruin Recruit in his right mind would even consider breaking his commitment NOW? With this Coaching Staff as evidence, Neuheisel is going to bring in an elite Recruiting Class next year too, so both Coordinators should have an interest in sticking around for a while, just to see how good it can get. Wouldn’t it be special to build UCLA’s first Football Dynasty? The Bruins have had a few other Dynasties, including thier Spirit Squad, and THAT is a Dynasty that is still going strong. Below are seven examples of ONE of the reasons why, when some idiotic trOJan breaks out the hackneyed, old “UC Lotsa Asians” joke, WE SAY “Thank you.” These photos don’t have funny captions, but if you click on them, they enlarge like that crunchy white glass-noodle stuff in a Chinese Chicken Salad does when it hits the oil in the wok. "MOO GOO GAI PANACEA: BRUIN STAFF GETS CHOWED" was published on January 21st, 2008 and is listed in Blue & Gold News, UCLA/usc/Cheerleader Photos. Uh, this isn’t really appropriate. We were THINKING ABOUT YOU SPECIFICALLY when we tailored this article for publication. We KNEW that you might find it insulting. That is why we put the disclaimer up front, and even pointed out that we don’t even know if Chow is actually of Chinese descent. We were just looking for a play on words, and we TRIED to remove anything that YOU would get mad about. In fact, the first draft called the Coaching search a “Chinese Fire Drill” that felt like “Chinese Water Torture,” but we got scared of YOUR PERSONAL reprisal, and took out those references. Our point is, that we honestly TRIED to keep it non-insulting. We even wrote some specifically pro-Asian comments, and posted what we feel are very flattering photographs of a beautiful Asian Cheerleader, as a tribute. Hopefully, you don’t sense any Racism or animus, even if you do think the whole topic should be OFF-topic. We clearly remember your disgust at the way we “used” Ben Olson’s Mormonism as a jumping-of point for attempts at humor. Our point is that we just want something specific to a player, that we CAN RHYME WITH!! “The Stomin’ Mormon” SHOULD have been a great and innocuous nickname. But because of “people like you” (and that is NOT meant as an insult, hence the quotes) who are somewhat sensitive to that kind of portrayal, our hands (tongues?) get tied. We just want to make people laugh, and anyone who has been paying attention knows that there is certainly no malice here, so please, Oldbruin, cut us some slack, and appreciate how much we “toned it down,” just out of respect for you. 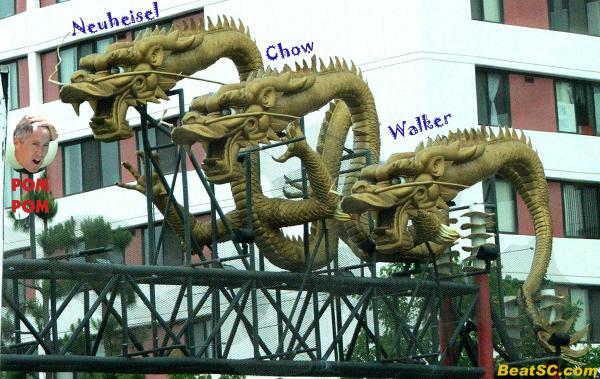 And besides, don’t you think the 3-Headed Dragon is awesome-ly SYMBOLIC? And two of those heads are “Photoshopped” in — We are kinda PROUD of the result. We would love to hear your response to this response. Hopefully, it will exude tolerance and understanding. P.S. If your issue is not with the Racial overtones, but with the obvious SEXUAL ones, then we’re sorry, but that sort of thing will always remain a staple here. We don’t want to offend any Race, but we don’t mind offending the (people whom we consider to be) Sexually Repressed or prude. [Added note: We understand that the “Oldbruin” who wrote that is NOT the same person as “OldBruin” from BruinZone, so this reply should be taken with a grain of salt]. This is what I see happening in the near future and the beginning of the end of the pompous, bombastic, classless, trojan arrogance found in their fans and players. With Norm Chow coming back to the college ranks as UCLA’s Offensive Coordinator. He now has the opportunity to put Carroll back in his NFLoser place, for Carroll’s misguided jealousy of Chows much deserved credit for USUC’s success. The Bruins now have the trifecta of solid coaches to start rebuilding a football program to take back Los Angeles and fulfill its BCS aspirations. With strong, knowledgeable and sought after coaches in Neuheisal, Walker and Chow. UCLA has the stature and instant credibility to lure talented football players to Westwood who are now assured not only an honest academic education, but coached by the best with NFL career aspirations. The Bruin faithful can now believe UCLA will soon have a football team our highly regarded, renowned and unpresumptuous university of the people can be proud of. Let us now officially recognize that our ½ Decade of Debacle of Dorrell is now over. We should also commend ourselves for recognizing a bad hiring earlier than our less then esteemed brothers in the City of Angeles did. Oh, wait. Has it already been forgotten? The trojan futility during the nineties with the failed second coming of John Robinson and then Paul Hackett. A period of time conveniently forgotten by trojan faithful and bandwagoners with their USUC embroidered hats, t-shirts, shorts, sweats, jackets, flags and beach chairs splayed across Southern California. How could eight straight wins over the trojans by the Bruins, losses to Utah in the Las Vegas Bowl and 8th place finishes in the Pac-10 conference be forgotten so easily. Oh yes, it is so very easy to forget about a losing past when your helped by money grubbing, NFL flopping cheating players like Reggie Bush. When the NCAA comes down hard on the USUC trojans, the whole Bush-Gate debacle will unleash sanctions against USUC that have not been seen since SMU received the death penalty for their money grubbing cheating players. To all the USUC apologists, please save your tired arguments that Bush acted on his own and without the knowledge of USUC. Yes, the coaches knew what was going on, yes those in the football operations knew what was going on, yes the players knew what was going on, and yes USUC should have the NCAA throw the book at them. Everyone is singing a tune to the NCAA. But its a NEW ERA and Bush is the only one not carrying the same tune as everyone else. Wonder why? A very bleak future is predicted USUC. With sanctions, loss of scholarships, stripped wins, ill-gotten titles and a tarnished heisman, how easy will it be now to keep the arrogance going for the USUC fans. No recruits will come to a damaged program, Carroll will not stick around to rebuild, and essentially, you go back to the Paul Hackett days and 6-6 seasons. How long will all those USUC bandwagon fans continue to wear the gear, fly the flags and fill a 90,000-seat stadium to watch cheaters and losers finish tied for 6th in the Pac-10 conference and lose in a bottom tier bowl game to a second rate opponent. Inconceivable? It shouldn’t be, the year was 1998, just 10 short years ago. Sleep well trojan fan. Sleep well. On another topic, as the “Beat ‘SC” website for UCLA fans, how can you have ignored the melee that was the final minutes of the women’s basketball game versus SUC at the Galen Center this weekend? Our Lady Bruins were out busting some ‘sc skulls, and no love for them on this site? I think you ought to link to the video of the altercation, and post some male cheerleader pictures in tribute. Any Bruin who stands up to trojan arrogance deserves our support. Thank you. And we don’t do inappropriate shots of BRUIN Cheerleaders any more, so as long as your girls go to UCLA, they are safe. As for the altercation, there are two reasons why we didn’t cover it. First of all, EVERY time that we talk about Women’s Sports, be it Basketball, or Gymnastics, Diving, Track, Tennis, and Water Polo (we’ve done articles and pictorials on all of them), we get ZERO response. Well, actually we DO get a response — All negative. The bulk of our readers just don’t seem to care about anything but Football, and Men’s Basketball. Since this incident was all about The Rivalry and the hatred that it breeds, we still would have covered it, but we decided to leave it alone, because of the final score of the game. If the Bruins had won the game, we would have been less inclined to bury the story. We recommend that interested readers go to YouTube, and search for the UCLA-sc brawl video, and always remember that the Lady Bruins have just as much fire, and just as much disrespect for trOJans, as the Men do.